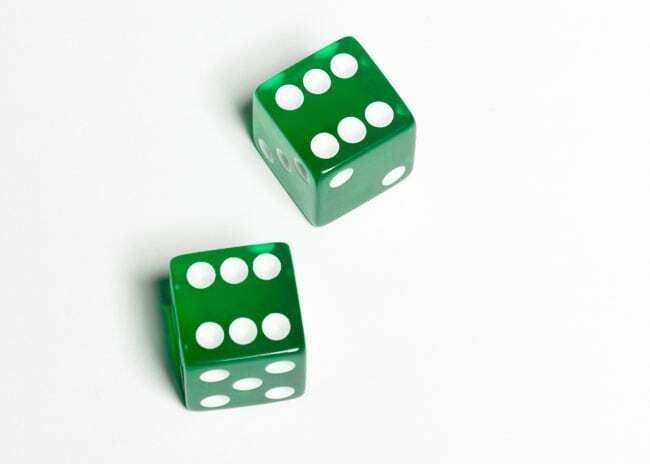 This roll of the dice predicts a 6-6 draw. Quick turnaround this week and next as Arsenal play Saturdays and Tuesdays. Fixture congestion means less rested players as well as a less rested preview writer in yours truly! In any case, Arsenal return to Europe in great domestic form, which is good because their European form has been abysmal. Mathematically, Arsenal can still qualify for the Round of 16 even if they lose both of their matches to Bayern Munich (or so I've read but haven't actually worked out on paper,) but it would not exactly be pleasant to coast into matchday five on zero points. Olivier Giroud is available again after serving a one match ban on matchday two for his red card in Zagreb, however, the Frenchman has seemingly lost his place in the starting XI to Theo Walcott anyway. Arsenal should have Petr Cech in goal again, especially now that David Ospina is doubtful with a shoulder injury; Ospina was not on the bench at Watford on Saturday. Gabriel is likely to return after missing Saturday through illness, while there are still doubts over Mathieu Flamini and Mikel Arteta, both of whom have not played since the win at Leicester. It's as you were with the long-term injured, for at least the next two months. After the match on Saturday, Arsene Wenger suggested that he might rotate one or two guys, including a potential rest for Alexis Sanchez, who is of course nursing an adductor problem, or Mesut Ozil. Yesterday, however, Wenger squashed that notion, because it would be lunacy to drop either of your two most creative attacking midfielders for a game like this. Predicted XI: Cech, Bellerin, Mertesacker, Koscielny, Monreal, Coquelin, Cazorla, Ozil, Ramsey, Alexis, Walcott. described as "The Diaby Zone." Arjen Robben has been out since September 3 with an adductor injury and while he is available again, the Dutchman did not make the trip with the club to London. Meanwhile, World Cup winning goal scorer Mario Gotze has been ruled out 12 weeks after rupturing a tendon in his groin during Germany's Euro qualifier loss to Ireland during the last international break. That sounds horrible. Franck Ribery (ankle,) Holger Badstuber (thigh,) Mehdi Benatia (thigh,) and Jan Kirchhoff (Achilles) all have yet to feature for Bayern this season, though Kirchhoff was an unused substitute this weekend. Sebastian Rode (tendon injury) has not played in a month. Predicted XI: Neuer, Lahm, Boateng, Martinez, Alaba, Alonso, Alcantara, Vidal, Muller, Costa, Lewandowski. Bayern their ninth win in as many league games this season. It took an hour, but Arsenal finally cracked Watford's defense at the weekend and put three past the Hornets, effectively meaning the club has picked up where they left off before the international break. That's a good sign considering that in addition to playing Bayern Munich twice, Arsenal will have matches against Everton, Swansea, and Spurs in the league, plus a League Cup tie between now and the November break. If there were any time Arsenal might conceivably get a result in a home game against Bayern Munich, it's now. Of course, Bayern Munich have a 100% record this season themselves (though, they did lose the Super Cup to Wolfsburg on penalties, essentially to Nicklas Bendtner.) They've won their two Champions League matches (against teams that, mind you, have beaten Arsenal) by a combined 8-0 scoreline. They have nine wins from nine in the Bundesliga; they are already seven points clear of second place Borussia Dortmund. And, at the same time as Arsenal were impressively beating Manchester United 3-0 a few weeks back, Bayern were beating their title rivals 5-1. It's conceivable they could have won the league wire-to-wire this season had they not slipped behind Dortmund on goal difference after matchday four. 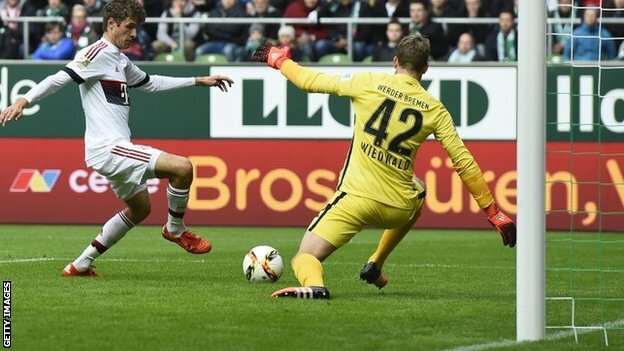 Bayern's away form in Europe, however, was less than stellar last season. They lost in Manchester on matchday five of last year's group stage and failed to win any of their three road games in the knockout phase; they drew 0-0 in Donetsk, lost 3-1 at Porto, and lost 3-0 at Barcelona. Arsenal should try to keep 11 players on the pitch. Arsenal have met Bayern Munich on eight previous occasions, including consecutive meetings in the Round of 16 in 2013 and 2014. 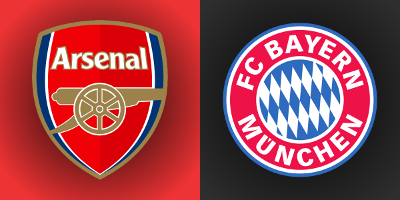 On both of those occasions, Bayern won at the Emirates; Arsenal were outscored a combined 5-1 in those two matches. Overall, Bayern have won four of the eight meetings; Arsenal have won twice and drawn twice. Arsenal's last win over Bayern Munich in London came in the 2005 Round of 16, as Thierry Henry scored the lone goal in a 1-0 victory; Munich advanced, however, having won the first leg 3-1 in Munich. In the second group stage in 2000, Arsenal blew a 2-0 lead at home against Munich and had to settle for a 2-2 draw. Bayern do not have a great record all-time on English soil, however, winning five of their 20 trips. Arsenal, all-time, have 10 wins in 16 home matches against German competition. Hang on. I got this. The match officials are from Turkey; the referee is Cuneyt Cakir. Astonishingly, even though Cakir has been working Champions League matches for six seasons now, this will be his first Arsenal match. He has previously taken charge of two Bayern Munich matches, both 2-0 wins for the Germans, against Villarreal in the 2011 group stage and against Roma in last year's group stage. Cakir has refereed some prestigious matches over the course of his career, including the 2012 FIFA Club World Cup Final, which saw Corinthians defeat Chelsea 1-0, the 2014 World Cup semi-final between the Netherlands and Argentina, and last year's Champions League Final, which saw Barcelona defeat Juventus in Berlin. John Painting is a contributing writer to the Modern Gooner and philosopher. You can follow him on Twitter @zorrocat , but WHY?